Donor’s Choose is a wonderful crowdfunding sites for schools. I have used it to complete over 7 projects with materials and a trip valued at a total of $3665.39. Descriptions of the these projects and links to their Donor’s Choose page are below. I highly recommend Donors Choose whether you have a project you need to raise funds for or if you are looking to donate to a school or teacher’s classroom. Spring 2016: This project raised money to send my high school theatre class to see Wicked performed at Dallas Summer Musicals in Fairpark. It paid for tickets and dinner. Click on the link above to go to the Donor’s Choose project page to see more photos from the trip. This was a student lead project- they put together the project for Donors Choose and I posted it. Many of these students had never seen professional live theatre before. Most of their theatre experiences have been school productions and One Act Play competitions. Seeing a massive live performance like this was a great experience for them. Before the trip students watched the behind-the-scenes on YouTube of how Wicked was put together called Behind the Emerald Curtain. Seeing it will allow them to get a complete picture of the show and an understanding of how a show of this scale is put together. 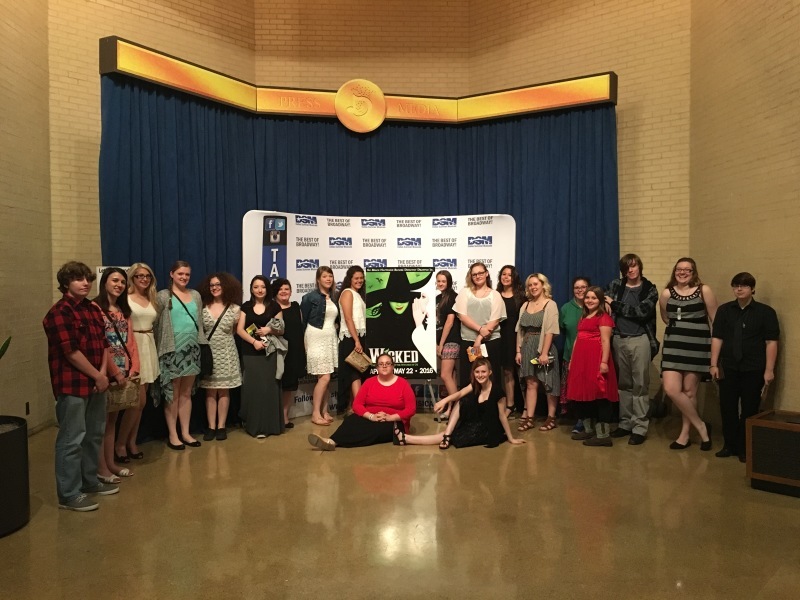 Seeing Wicked live gave my students a wider perspective and a theatre experience that they will not forget! The following year (Spring 2017) I took a group of students to see STOMP. It was only $15 a person so this time students paid for it themselves with drama club covering a portion of it. These books have been used in my ENG 2 courses to incorporate multicultural reading materials into the classroom. 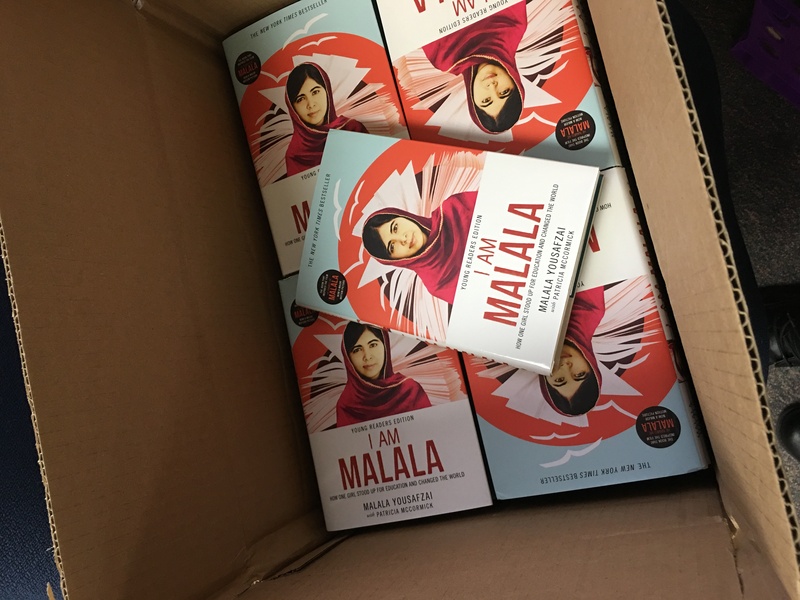 With the “I Am Malala: How One Girl Stood Up for Education and Changed the World” class book sets my students are able to read it to gain a greater understanding of this amazing young woman and her experiences. It also jump starts a research project into education and freedom of speech issues/debates around the world. This student edition of this memoir has photos and materials that help my students with this project. This memoir helps my students gain a deeper understanding of the middle east and the Islamic communities who are also negatively impacted by terrorism. With world events I think this is a crucial time to encourage students to learn more about this and of brave people fighting the good fight such as Malala. I was able to get a set of the I Survived series of books which is high interest for low readers. Students who are normally reluctant readers eat these books up. They provide my students a look at places they haven’t been and interesting parts of history. They are interesting, they are on their level, and these books are motivating my students to keep reading. My theatre class received special effects makeup kits that were used to practice skills such as creating bruises, cuts, wounds, etc. as part of our technical theatre unit. The students had a blast and loved learning this professional skill! This project gave us class sets of Anne Frank: The Diary of a Young Girl and Long Journey Home: A Young Girl’s Memoir of Surviving the Holocaust. We also received a few books about World World II to help students research the time period. Students read both books to get two perspectives: One from a girl who survived and one from a girl who didn’t. They then researched this period each coming up with their own research questions related to the historic events in the memoirs. This project was for a bunch of novels, memoirs, and nonfiction texts about women throughout history. This allowed students to read across genres. This women’s history project helped expose students to conditions and cultures around the around and within other parts of our own country. This is important as students in this rural school rarely travel far outside of the county. I’ve chosen books about diverse women and books at different reading levels to meet our students needs. These books opened my students eyes to other cultures and expand their views on what roles/jobs women are capable of. This was a spring board into a research project where students developed their own research questions based on the books they had read from this project. This project was for two class sets of graphic novels: Alan Moore’s V for Vendetta and Shakespeare’s A Midsummer Night’s Dream. Shakespeare in comic book form grants students better access to his work by giving them visuals to help them understand his language. It engages multiple forms of literacy and presents Shakespeare in a way that they can relate to and get excited about. We use these graphic novels to examine how Shakespeare has endured and continues to be adapted into different forms (such as this comic book). We also discuss how this comic book adaptation impacts our reading of this play. V for Vendetta by Alan Moore is a prime example of popular culture serving as social commentary in that it continues the conversation in Orwell’s 1984 dystopia- allowing us to tie it into British literature tradition (we will discuss that during this unit). Comics engage students and utilize multiple forms of literacy including print and visual literacy. Using the V for Vendetta comic we are able to tie into larger media (such as the film) and current events (such as how protesters around the world utilize iconography from Moore’s V for Vendetta comic). 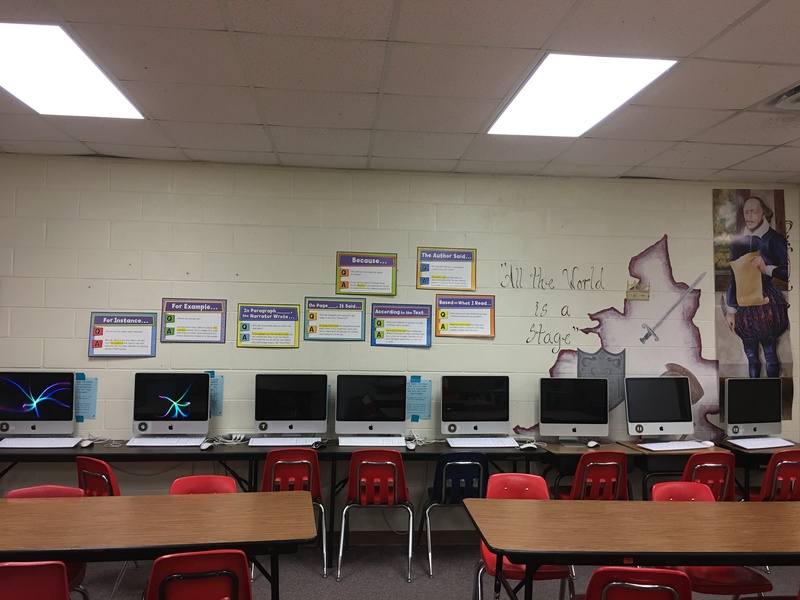 I am lucky to have 14 refurbished iMacs in my classroom and a few windows laptops. This way I can have a group of students working independently on the Google Classroom while I work with a smaller group reteaching or giving additional tutoring. It is also great for students to create presentations or essays on the Google Classroom. I use a variety of education apps in addition to Google education. My school district uses desks instead of tables to encourage us to use more project based learning in our lessons. This setup allows me to freely walk around the room during class to observe or assist each group throughout the project or lesson. The white board is on the right side opposite of the computer wall. Most posters were taken down before the photo was taking to accommodate testing in this room and have not gone back up yet because more testing is on its way. I utilize a hanging folder for missing work. Each class period has a folder. 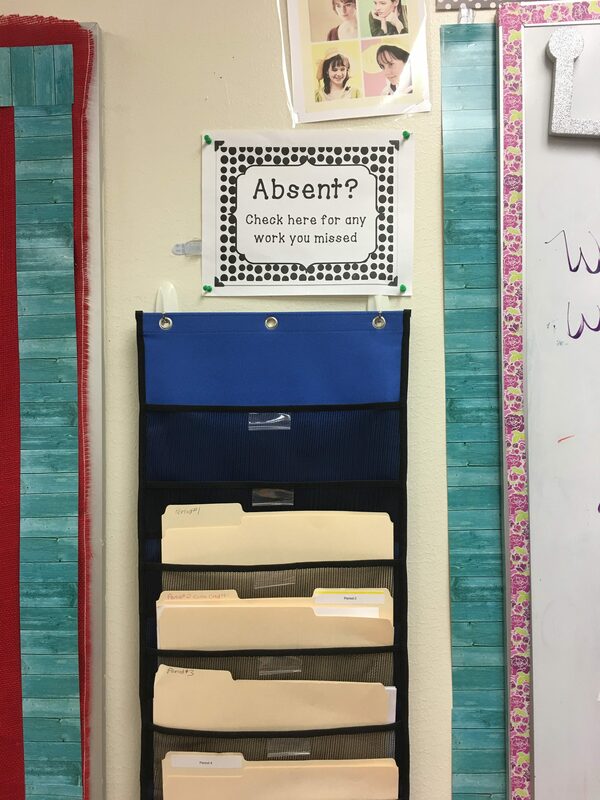 Students who were absent are reminded to check their class folder for any assignments they missed as well as checking the Google Classroom. This makes it super easy for me to keep up with missing work. I just write down the students name and date on the paper and stick in the folder during class. That way I don’t have to search for it later and the students know where to find it when they return to school. I only have one bulletin board in my classroom. I change up the displays throughout the year. This one features the A.C.E. strategy for writing short answers or extended responses. 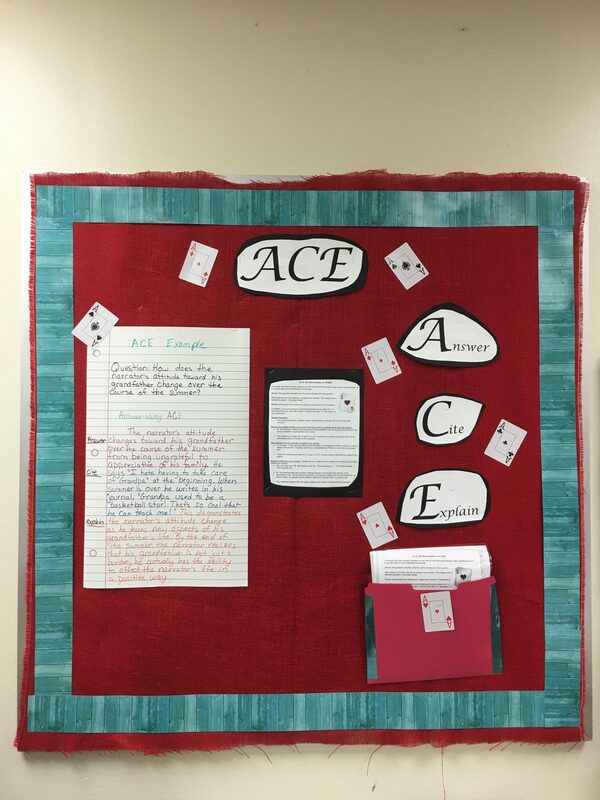 A.C.E. stands for Answer the question, Cite evidence, Explain how the evidence proves the answer. Answer, Cite, Explain. The folder has instructions and models that students can utilize when working on short answer responses. This is my central command. The desktop is connected to the projector. On the hanging wall organizer I have my handouts and work sorted and organized. 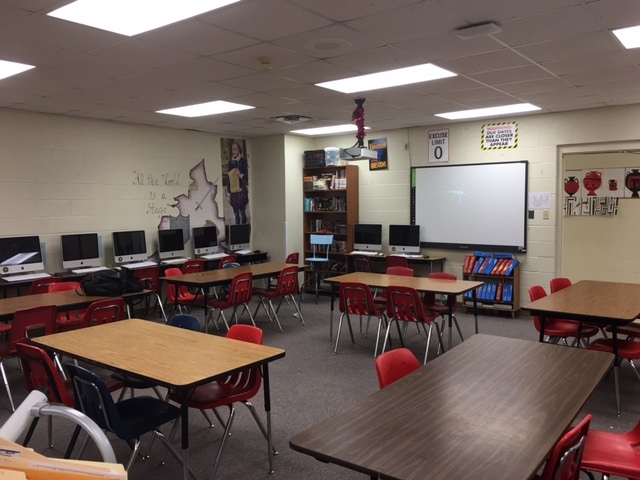 It’s ready to go for each class I teach (I teach several different classes this year: ENG 1 Honors, ENG 2 Honors, ENG 2, Dual Credit English, Theatre – High School level, Theatre – 8th grade level, and STAAR EOC remediation). 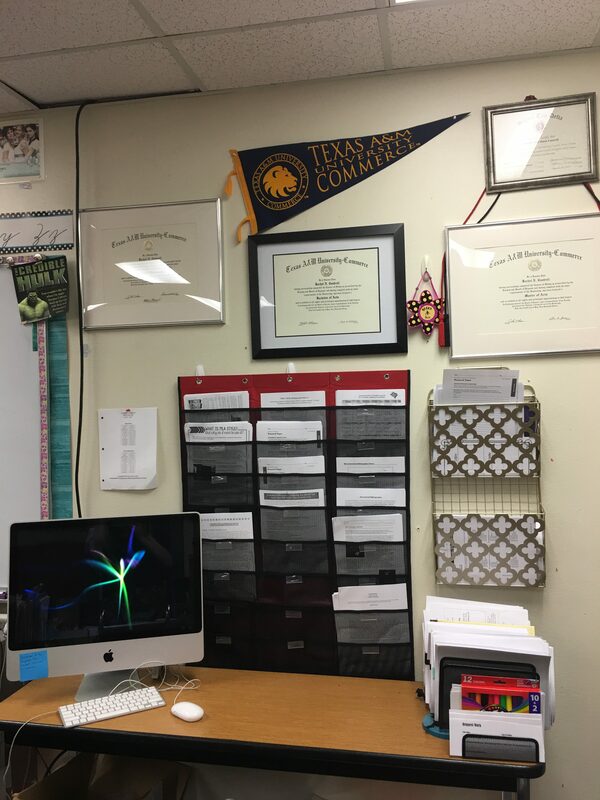 I have my college wall above it with my diplomas, certificates, and my college gear to inspire my students to reach their college dreams.